WORLDWIDE: Offshore windpower is one of the fastest-growing renewable energy sectors, attracting substantial interest and investment in Europe, the US and China. Developers are exploiting the strong and consistent wind resources at sea to drive down the costs of wind-generated electricity. Development has largely been confined to fixed-bottom foundations in shallow waters. However, floating offshore wind turbines eliminate the depth constraint, opening up new possibilities for reliable power generation, not least at deep-water, near-shore sites, which could support conventional high-voltage AC transmission. By tapping into the potential new sites, floating turbines will propel the industry to launch R&D projects and introduce new technology. More countries will be able to benefit from the clean energy, supply security, and cost benefits of offshore wind. Every step from design to installation of a floating offshore wind turbine is more expensive and technically demanding than the equivalent onshore installation procedures. To secure the status of offshore windpower as a safe, dependable source of energy, industry professionals have put enormous efforts into providing reliability and simplicity throughout the lifetime of a project. All floating wind turbine technologies share a common challenge, though: the platforms need to be held firmly in place in a cost-effective way. High-quality mooring foundations are of critical importance. The harsh marine environment, erosion and high wind speeds can all shut down the turbine if the foundation is not sturdy enough. The mooring system (mooring lines and anchors) guarantees the safety of the installation and, together with the floating platform and the marine risers, builds a complex configuration. The following are the most common mooring system installations. Catenary mooring systems can be deployed in water depths of up to 100 metres, and combine chain and wire ropes. The system relies on its own weight to provide restoring forces. Its disadvantages can be increased production costs and greater vertical loads; the main advantage is that the anchors are only subjected to horizontal forces. However, increasing the length of the mooring lines also increases their weight so catenary systems become less economical in deeper water. In depths beyond 100 metres, the weight of the mooring line becomes critical and encourages the adoption of polymeric ropes for taut leg mooring systems. These are light and flexible, can provide large restoring forces, and improve the drilling condition and energy density (MW/km2) by reducing the spacing required between units. The disadvantage is that the anchors need to handle a significant vertical force, which would increase the stiffness and impact on the dynamic behaviour of the floater. Semi-taut mooring systems, combining taut and catenary lines, are mainly used in deep-water applications. The spread mooring system consists of a group of mooring lines distributed over the bow and stern of the platform. This is a relatively flexible solution suitable for most water depths. Hybrid systems, consisting of buoys and catenary lines, are also available. The performance of the mooring system can be estimated based on the motion response of the platform, the tension on the mooring lines and the requirement for the anchor’s holding capacity. There is significant activity among marine renewable energy professionals towards the development of new floating foundations and the key challenge remains that they need to be adaptable to accommodate different dynamic characteristics and a distinct loading pattern. The environmental factors needing to be considered when designing a mooring system are extreme wind conditions, waves, currents, tides, marine growth, air temperature and air density. It is essential that the foundation is designed to bear all the stress, but also to be easy to install and maintain. Besides the mooring lines, the other important components of the complete system are the anchors, on whose strength the entire configuration relies. There are three common anchor types: drag embedment, suction, and vertical load. With cost-efficient operation being the aim, developers are continuously seeking better solutions for floating platforms. Mooring lines can accommodate different components to improve their performance. It has been demonstrated that mooring systems with clump weights have excellent stiffness and fatigue-resistant properties with a reduced mooring footprint. Clump weights, especially in cast iron, are robust and easy to install and maintain. They are designed to be attached to the mooring lines in order to ensure the restoring forces without resorting to expensive solutions or longer lines. Available in two designs, cast iron clump weights can easily adapt to mooring configurations. The "distributed" clump weights are spread along a segment of the mooring line to ensure the proportional recovery of the loads. The "mutualised" clump weight (from a few to hundreds of tonnes) is positioned closer to the platform to guarantee the restoring forces by breaking the mooring line tension. High-quality and innovative cast-iron clump weights can be customised to adapt to the different needs of each mooring system based on the target weight, the chain line diameter and the available means of installation. Cast iron offers many advantages for a wide range of marine renewable energy solutions. The correct dimensioning eliminates oversize and the high density of the material significantly minimises cost. Moreover, it is usually sourced from best raw materials and is fully recyclable at the end of a project. The European leader in the manufacture of cast iron counterweights, the French foundry FMGC, assigned Vivo Environment (marine environment and oceanographic consultants) to conduct research on the impact of gray cast iron on the marine environment. The study has delivered important information on the corrosion of iron in the marine environment, biofouling (colonisation of marine species) and the material’s ecotoxicity. It concluded that corrosion varies from between 0.5 and 1mm, according to site conditions, colonisation of marine species is facilitated and the ecotoxicity of cast iron poses no relevant risk. 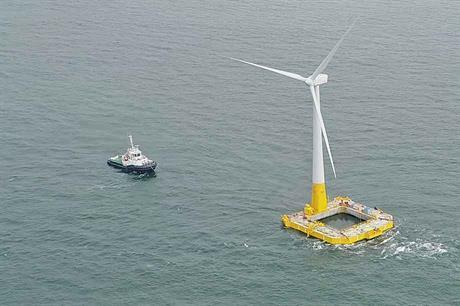 The floating offshore wind energy sector has successfully outgrown its R&D status and is now deploying the latest technology available in the supply chain. Solutions such as high-quality cast iron clump weights have been designed and manufactured to overcome the sector’s common challenges, and by targeting higher output and greater safety, such components can promote confidence among investors.